This is my Unity Friends With Flair Entry. This is another one of the backs of my Faber Castell Design Memory Craft chipboard mini journal pages. 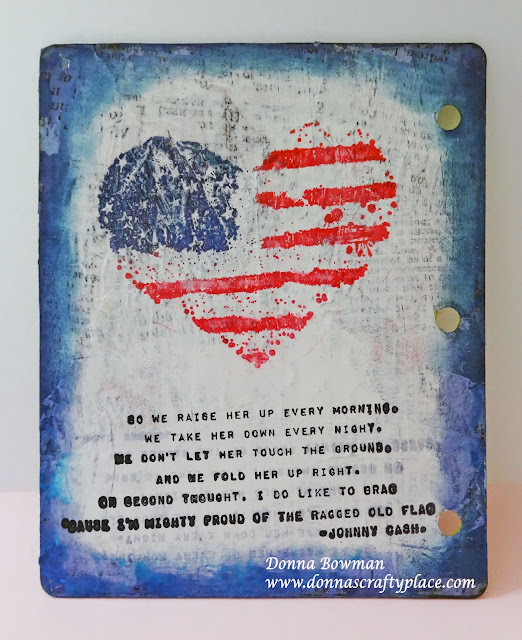 I used DecoArt Decoupage to put Tim Holtz Text Tissue Paper on the background. Then I covered it PaperArtsy Chalk ink in the Chalk Color. I used a credit card to spread the paint. Then I covered the Heart stamp with Cobalt and Red Geranium Archival inks. I stamped the sentiment with black Archival ink. It's a little crooked but what are you going to do? It's just an art journal page. I inked the edges with a mini Distress Blender Tool and the blue Archival Ink. Both the stamp are from Unity Stamp Company. Thanks for stopping by! This is gorgeous! And I love that your sentiment is crooked; it's perfect! My husband critiques my work and is constantly telling me to put "this or that" at an angle rather than straight. It just works better that way sometimes. This is really gorgeous! I actually like the sentiment crooked it adds to the distressed look!! Oh wow, this is awesome. Love the flag and saying together, Donna. I adore that text tissue background. What a fabulous card!!!! Lovely page! I like how you put the sentiment at an angle!